Build a Successful Ecommerce Business! Coming soon: Get my FREE mini-course on how to build a successful ecommerce business. Learn what to focus on first and start increasing sales today! How can I improve the SEO so that my ecommerce site comes up? This is a great question and perhaps one of the most common questions new ecommerce store owners ask about. Because it’s one of the most common questions and because getting it right is important – especially when you are starting a new ecommerce site – there are hundreds of blog posts already highlighting these tips I’m about to show you. So why write another post? Because I’m going to show you specific examples that ecommerce site owners and marketers can use to improve how well your product pages rank. To make it easier for customers to find you via search on Google, there are 3 points you will want to focus on. While fairly basic, these three points form an important foundation for your future search engine marketing efforts. But just because they are basic, doesn’t mean they aren’t effective. Prior to 2012, these three points alone could move an already well ranking site to the #1 spot on Google. Though not quite as powerful today, these three SEO steps still have the ability to move a product from the second or third page of the Google results to the first page – and that’s exciting to watch happen! Before we dig in, I’ll be talking about “keywords” and “keyword phrases.” If you are not familiar with what these are, read this article. A title tag is a brief description of about 70 characters in length that describe what a webpage is about. It is mostly used by the search engines, but visitors do see your title tag in the search results. While having any title tag is preferred over not having one, using the automatically generated tag isn’t going to be good enough. To make it easier for visitors to find you, you’ll need to customize it a bit. Remember when I said that title tags are mostly used by the search engines, but visitors do see the tags in the search results? While the “perfect” title tag doesn’t exist, there is a formula we can follow to help us create a tag that gets noticed by both search engines and potential customers. Of the five words in the title, only two give me an idea (albeit vague) of what I can expect to see if I click through to that page: a swimwear top. While “Wanderlust” and “Earth” may be relevant because they are the name of the product, they don’t help the search engine or visitor know what they are about to look at. If you were the only website online that sold swimwear tops, the customer would search using those two keywords, they’d find your site, and you’d make a sale. But since you’re not the only site online, you need to define the product using keywords that customers are using to find a product like yours and add them to your title tag. Material: Cotton, polyester, spandex, or recycled polyester. With only 70 characters, you won’t be able to use all of the descriptors. But, you can determine which of those descriptors (keywords) are going to bring in more customers. This can be done using the Google Adwords tool. The Google Adwords Keyword Planner will allow you to add the above descriptors and tell you how many people are searching for swimwear tops + one of those descriptors. For example, “Recycled Swimwear” is actively searched for (and is searched for more than any of the other descriptors). With this information, we can begin writing our new title tag. You’ll notice that the last two do not include the product name (even though I said the formula for a good title tag is to include the product name). In this example, the product name is so unique that it is unlikely people will be searching for it by name. But also because it is unique, if someone does search for it by name, Google will still return your page because the name will be in the headline and content. So in cases like this, it would be better for us to use keywords to describe our product. Doing so increases the chances that someone who has never heard of us will find us because we have the product they are looking for. I had a disappointing experience with how Google Adwords credit works and wanted to mention it so that you don’t run into it the first time around. I want to say up front that this mistake is 100% my fault. Sure, I feel Google could have communicated this a bit better, but ultimately I need to take ownership for not understanding the way these credits work. 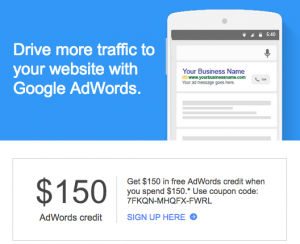 The deal is: Get $150 in free AdWords credit when you spend $150. Seems clear. When I redeemed the coupon, I set the daily ad budget to $10/day. My thinking was, $10/day times 30 days in a month = $300. I pay $150 and Google pays $150. Perfect. I thought I’d spend the first $150 and then the $150 free AdWords credits would cover the next $150. But here’s the catch: The credit is applied after one month, not after you spend $150. In other words, if you pay at least $150 in AdWords credits during the first month, then, the second month, you’ll receive the $150 in free credits. If you only spend $100 during that first month, you’d only receive $100 in free AdWords credits. In my case, I was charged $250* around the one month mark and before the $150 was credited to my account. Had I known that, I would have set my budget to $5/day so that the first month was closer to $150 ($5/day x 30 days). * The math doesn’t add up perfectly to $300 because I paused the campaign and made some changes. I just stumbled upon this time saving trick in Shopify. And you need to know about it. I love MailChimp. I worked for them. I’m loyal to them. 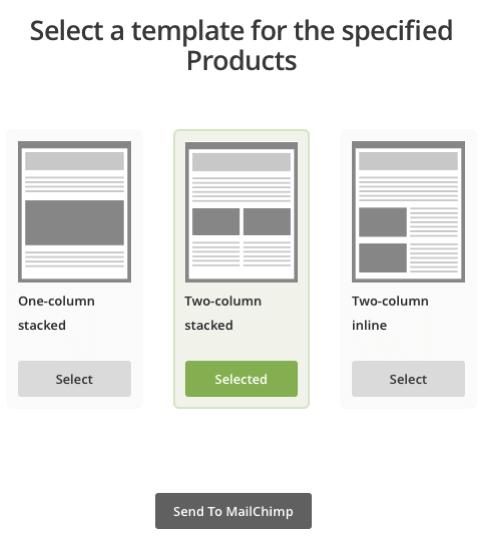 They the most full-featured email newsletter tool available that is actually a joy to use. But it even takes me longer than I’d like to create these campaigns. First, you’ll need to install the MailChimp app for Spotify. Then head over to your Products section in Shopify and select the products you want in the newsletter. 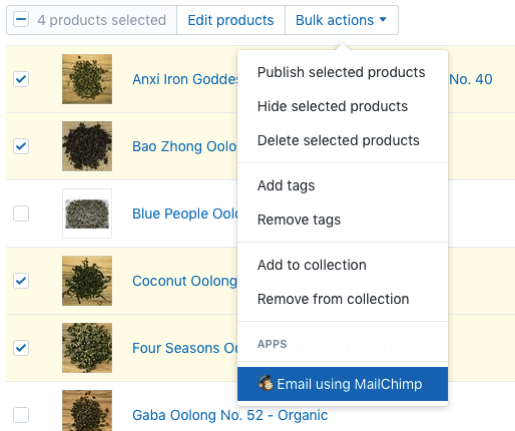 After selected the products I want, click on Bulk actions > then click on MailChimp. I like the two images side by site, but you can choose any you like. Click Send to MailChimp and then you’ll be taken to the MailChimp campaign editor where the campaign can be customized and fine tuned. One caveat is that the products are added using a code block. If you try to edit the products, you won’t be able to using the easy-to-use drag and drop editor. Instead, you’ll see HTML. 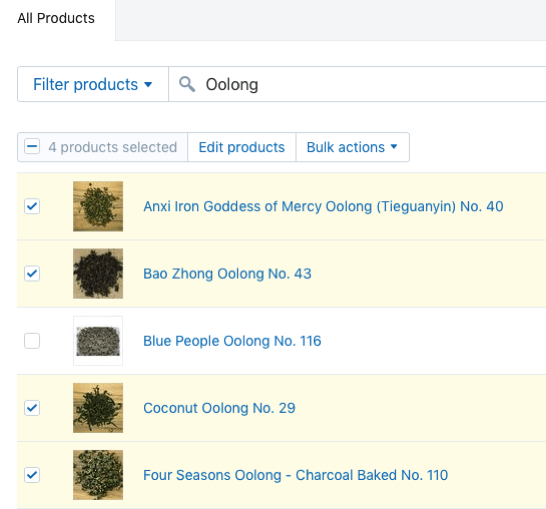 For the past six years (2010-2016), Tea Chai Té had been using Volusion to run it’s ecommerce site. But with the move to Shopify, it meant we’d lose all our customer history – data that I’ll be using grow our company. So before we shut down Volusion, I exported all of the data I could get my hands on without hiring someone to run SQL queries for me. One of the Volusion reports was Order History. This export shows the details of every order: Who ordered, when they ordered, how much (in dollars) they ordered, the shipping cost, and how they paid. What it doesn’t show is what they ordered, but that is for another post. But this report is valuable because it allows me to see how many orders a customer made and how much they spent. A great way to see who our top customers, how often they order, and their average order size. But the problem is that all of this data is spread out. So I started with one goal: Sort the list so that I can see what customers have placed the most orders. 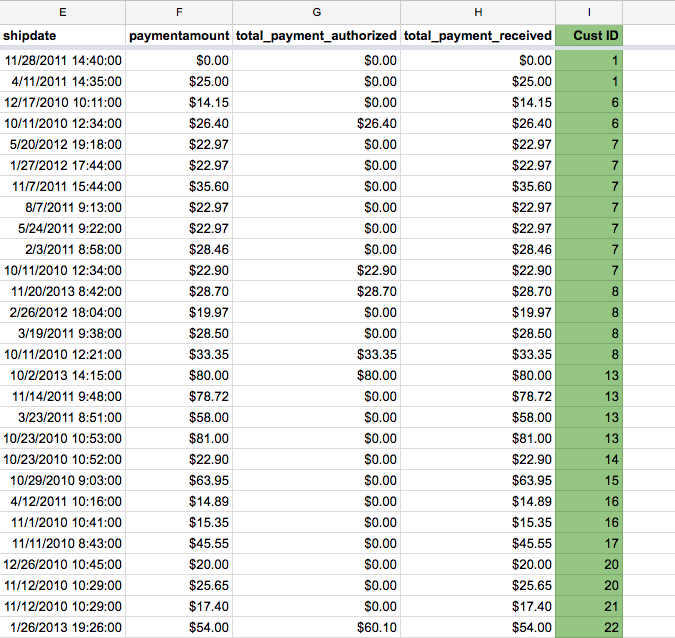 To do this, I opened up my spreadsheet (I’m using Google Sheets), found the “Customer ID” column and sorted. Looking at the green “Cust ID” column, you’ll see that customer #1 made two purchases. Customer #6 made two purchases. Customer #7 made seven purchases. Customer #8 made three purchases. I didn’t want to manually count and enter the number of purchases made for every customer ID, that would just take too long. This formula tells us how many times that customer ID displays in a range of cells, in this case, from cell I2 through I1994. The second “I2” is what customer ID to look for. I pasted that formula in cell J2 through J1994. As you can see, if we look in column “I” we see there are two customer IDs of “1,” which is printed out in column “J.” For customer ID of 7, we see there are seven purchases that have been made. And for customer ID of 8, we see there are 4 purchases. At this point, there are still a lot of numbers to look at, but we are going to ignore it, because we can now see who are biggest customers are. We can now see that Cust ID 898 has made 36 purchases (there are 35 other rows above this one, but I scrolled down so you could see the formula at work), Cust ID 887 has made 20 purchases, and customer 124 has made 18 purchases. And again, as I scroll to the bottom, I am able to see who only made one, two, or three purchases and target them in a different way.